VIVA MARCELLA! | Jane Lear. Writing on Food and Travel. On Sunday, Marcella Hazan, Italy’s greatest gift to home cooks everywhere, died at the age of 89. The world is diminished. And I know I’m not alone in paying tribute in a way she would have appreciated: by cooking. There’s an armload of basil in the refrigerator, just waiting to be transformed into pesto, what she called the most seductive of all sauces for pasta. There’s a bottle on the counter, too. I favor Old Forester over Marcella’s Jack Daniel’s, but, after all, nobody’s perfect. I know the recipe by heart, but that doesn’t stop me from taking down The Essentials of Classic Italian Cooking from the shelf. 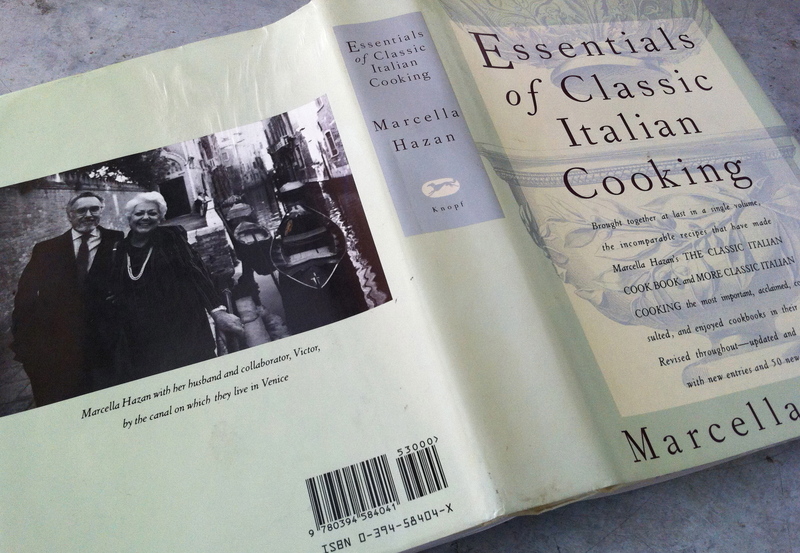 Published in 1993, it was an updated compilation of Marcella’s earlier Classic Italian Cook Book (1973) and More Classic Italian Cooking (1979). Aside from 50 new recipes, additions included a chapter called “Fundamentals,” a treasure trove of information about ingredients and how they respond to different cooking techniques. Marcella’s singular voice was famously translated into prose by her husband, Victor. Open the book to any page, and you begin to gain insight into the Italian art of making something transcendent out of the simplest everyday ingredients. A classic example of what I mean is Finocchio in Insalata, my go-to salad after roast pork loin or other rich meats. “No vinegar or lemon juice is used on raw finocchio when it is served alone,” the note reads. And so you cut a fennel bulb into the thinnest possible rings, soak them in a couple of changes of cold water, dry them, then “toss in a serving bowl with salt, enough olive oil to coat well, and liberal grindings of black pepper.” In Amarcord, Marcella’s autobiography, she recounted that this salad was part of the lunch she served Craig Claiborne in 1970. He was enchanted. And Marcella, a biologist who had left life in Italy to marry Victor, a New Yorker, was propelled into a new career. Because Marcella’s recipes are delicious and virtually foolproof, practically everyone has at least one favorite, and the New York Times is compiling a wonderful assortment of them. (Somewhere, Craig Claiborne is smiling.) I think the first chicken I ever cooked was her Roast Chicken with Two Lemons, and I love it still. Her Meatballs and Tomatoes? My husband’s first and only meatball recipe. And odds are the most Googled recipe of all time is Tomato Sauce with Onion and Butter, which has (aside from pasta and Parm) just four ingredients: fresh or canned tomatoes, an onion, five tablespoons butter, and salt. Its fame continues to grow; if only someone had remembered to tuck a copy inside Voyager 1, it could have gone interstellar. She’s respectful of cooks who insist that pesto isn’t pesto if it isn’t made with mortar and pestle. The word, of course, comes from the verb pestare, to pound, and she carefully outlines the traditional method. But, “it would be a greater pity … to pass up making pesto at home because one has not the time or inclination to use the mortar,” she wrote, and preceded the mortar recipe with a “nearly effortless and very satisfactory” food processor method. 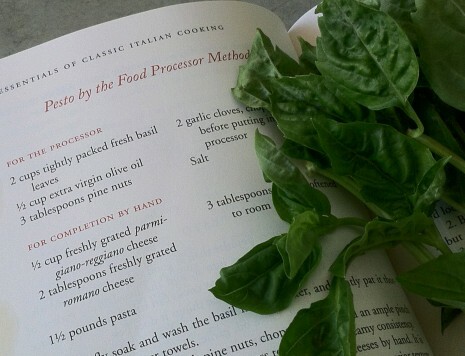 In addition to being easy, the recipe is a revelation to people who find pesto too intense. It’s not overloaded with garlic (“Never, in good Italian cooking, should it be allowed to become harshly pungent”), and the proportion of tangy pecorino romano to Parmigiano is less, since romano is more potent than other pecorinos. A little butter enriches and rounds out the flavor beautifully. Thank you Marcella, for everything. If freezing pesto, make the sauce to the end of step 1 and freeze without the cheese or butter in it. Stir in those ingredients after the pesto is thawed, just before using. When cooking spaghetti or fettuccine for the pesto, reserve some of the cooking water, and add a little to the pesto—that helps it coat the pasta more easily. The full Genoese treatment, Marcella notes, is to add boiled new potatoes and green beans to the pasta. Drizzling the pesto on potatoes or green beans separately is also pretty great. Oh, who am I kidding? I could eat it on cornflakes. 1. Wash the basil in cold water and gently pat it dry with paper towels. Put the basil, along with the olive oil, pine nuts, chopped garlic, and an ample pinch of salt in the food processor and process to the desired consistency. Marcella likes it uniform and creamy, but I prefer it a bit coarser. Perhaps one day, I’ll see the error of my ways. 2. Transfer the sauce to a bowl and mix in the two grated cheeses by hand. Then mix in the softened butter, distributing it evenly throughout the sauce. To store, press plastic wrap on the surface of the pesto and refrigerate. Posted: October 1st, 2013 under cookbooks, people + places. Yum–that sounds like a delicious substitution…..